Lanes of NZ produces Foot fleece which is a Natural New Zealand lamb Wool Fleece product to put in Trampers boots to stop blisters. 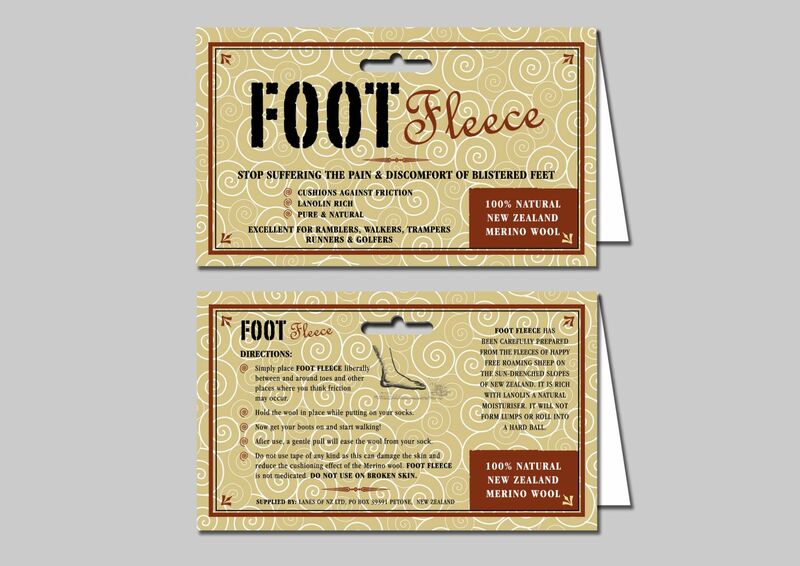 Client: Lanes of NZ Ltd.
Project: Packaging for ‘Foot fleece’ Natural lambs Wool Fleece for Trampers boots. Format: Card labels that are folded and stapled to the top of a plastic bag containing the fleece product. Brief: To create exclusive packaging which reflects Footfleece’s high-quality natural product. Solution: A simple natural label design. Contrasting fonts were used for the products name a stencil stamp font was used for ‘foot’ and a curvey decorative font used for ‘fleece’. Natural colours are used including brown and beige. A swirly line art pattern for the background reflecting the pattern of natural wool was created.